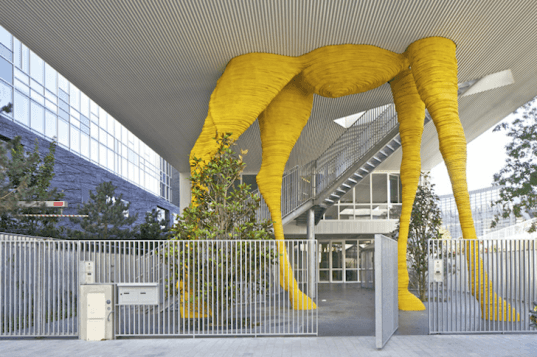 As you're driving through the suburbs of Paris, you turn a corner and suddenly see a giant yellow giraffe ahead of you. After checking your coffee to see what extra goodies your barista put in it, it might occur to you that wild animals don't belong in Boulogne-Billancourt. 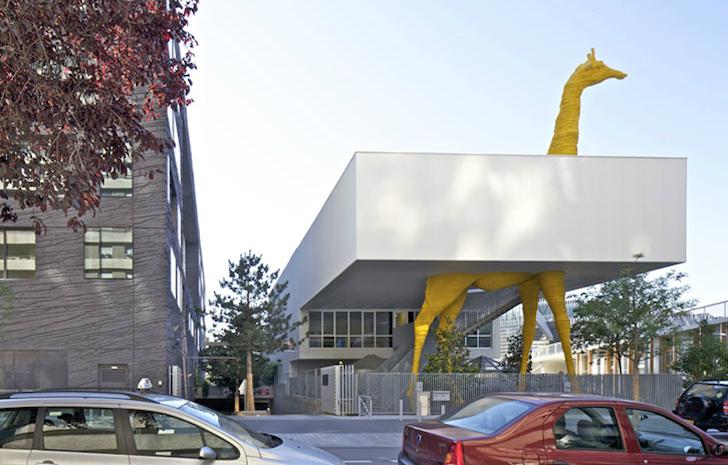 But it will also make your day - and that's the idea behind Hondelatte Laporte Architectes' Giraffe Childcare Center. Both a childcare center and a nursery with animal sculptures that liven the place up, the curious building adjacent to Jean Nouvel's Horizons Tower was recently awarded the green Zéro Energie Effinergie label. The 1,450 square meter Giraffe Childcare Center is located in a dense area in the suburbs of Paris. The childcare center has 60 beds while the nursery has 20. There are three tiers, all with south-facing playgrounds that are well-connected to the interior programs, and each is marked with a fun concrete animal sculpture. There’s the giraffe, through the legs of which one enters the facility, a polar bear clambering up steps, and a suite of giant ladybugs on a wall. Although the design brief doesn’t mention how the building, which is clad in white corrugated iron that contrasts with the urban landscape, achieved net zero, one assumes that it generates its own energy and features high efficiency. The giraffe is the most distinctive aspect of the design, as it can be seen from many different angles, and it is designed to animate imaginations. Going to the doctor will never seem boring again. There's also a polar bear!